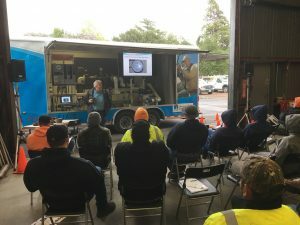 The City of Sonoma Public Works Department Water Division recently hosted one of five Pacific Gas & Electric Company (PG&E) Water Pump Efficiency Training courses for municipalities. Staff from other local water systems attended this training. The City’s Water Operations Supervisor, Steve MacCarthy, made the arrangements for the training. The Water Pump Efficiency Training makes the connection between distributing the water, which water operators are familiar with, and the energy and demand cost to do so. The training trailer had pumps that run while showing a real time PowerPoint demonstration of how varied operating conditions will increase or decrease water operators cost to run their pumping systems. It was a great opportunity to bring local water operators together for an informative training session. “It takes a lot of energy to pump water. Learning about energy efficiency for water pumping operations helps the City reduce costs and meet our sustainability goals,” said Public Works Director Ferguson. Learn more about the City’s Water Division operation and water supply and distribution system on our Water Division page.